Yesterday was a long day, but it was also quite a successful one. I cycled 51km (32 miles) around London, including an SJA duty, and I've made progress towards a couple of my New Year Resolutions. I was out with CRU in the morning, and we cycled from central London to Richmond Park for a cross-country run. Our route included the whole of CS8 (one of the Cycle Superhighways): it's pretty well marked, except for the area just south of Chelsea Bridge. At the park, we did a couple of slow laps around the course, following the runners. That was quite peaceful, and there was no sign of FENTON! There's a BCQ checkpoint in the park, so I visited that after we were stood down. On the way back, we took the train from Barnes to Waterloo. You might think this was the lazy option, but I prefer to think of it as vital reconnaissance for future events. In particular, we wanted to find out whether they have step-free access there; it turns out that you can get onto the outer platforms (1 and 4) quite easily, but you can only access the inner platforms (2 and 3) via the footbridge. So, I don't recommend arriving there with a bike, wheelchair, etc., because you risk getting stranded in the middle. When we arrived at Waterloo, the train heading for Twickenham was jam packed (because of the rugby match). There were several armed police at the station, which seemed unusual; I don't know whether that was related to the big crowds. A perk of being in uniform is that the police nodded and smiled to us, so we had a brief chat. "You been anywhere interesting?" "Cross country at Richmond Park." "Nice." A couple of weeks ago, the BBC reported severe weather warnings, but it turned out to be very sunny yesterday. Our CRU uniform trousers have zips around the knees, which means that you can remove the lower half to turn them into shorts, so that's what we did for the journey back to base. After the duty finished, I had a few other errands to run in central London. I'm currently bereft of bicycles: my new Roberts bike is still under construction, and my Brompton is in for repair (broken spoke on rear wheel). So, this seemed like a good opportunity to try out a "Boris bike" again. I used one of these last June but I couldn't get my key to work so I used my debit card instead. I've now discovered the problem: you have to activate your key before you can use it, so that TfL know that it went to the correct address. I did that online, and the key worked perfectly yesterday. It's actually a lot easier than messing around with my debit card, so I'm glad that I paid the extra £3 for it. To take out a bike, I just put my key into the slot next to the docking point, wait for the light to go green, then remove the key and pull out the bike. (Quick tip: it takes a bit of force to pull the bikes out or push them back in.) I don't have to use the central terminal or type anything. The basic idea is that you pay £1 for daily access, then any journey up to 30 minutes is free. If you want to use a bike for longer (without paying extra), you can return it and wait for 5 minutes before you continue journey. I think that works well if you're making a short journey and you know where you're going, but it's not so good for exploring. I started by going from the Barbican area down to Southwark, in search of another BCQ checkpoint. This took longer than expected, partly because of road closures, so I'd almost used up my 30 minutes when I reached Bankside. I found a docking station there, but all the docking points were full up. Fortunately, the system allows for this: I went to the terminal and pressed the relevant button, then inserted my key when prompted, and it added "up to 15 minutes" so that I had time to find a new location. I repeated this a few more times, and had that bike for an hour before I returned it, without paying any extra. As you can see, I spent a while going in circles! When I got the time extension from each terminal, I could bring up a list of nearby docking stations, showing how many bikes and vacant docking points were available at each one. The only snag is that this was a list of names, e.g. "Poured Lines, Bankside". There was also a map on the side of the terminal, showing bike icons for any docking stations, but this didn't have names. It would be better if these could be linked together, so that you could get the map location for a particular docking station. (Then again, maybe you can do that by touching the screen; I'm not sure whether I tried.) Street names are fine, but station names didn't mean much to me. If you have a smartphone then "there's an app for that" (TM) which will show you the nearest vacant docking points to your current location. Still, I eventually found the elusive Poured Lines: it's at the west end of Southwark Street, just before you reach Blackfriars Road. That had loads of vacant points so I put my bike in and stood next to it for 5 minutes (a convenient opportunity for a snack break), then took it back out again. "By Thames Path near Southwark Bridge. On metal gates at riverside entrance to the Globe Theatre are a number of small iron figures represented in Shakespeare plays. What are the two other figures on the bottom row of the right hand gate? Bird _______ Deer __________ Cat"
The point of the BCQ is to motivate you to explore places that you wouldn't otherwise have gone to. 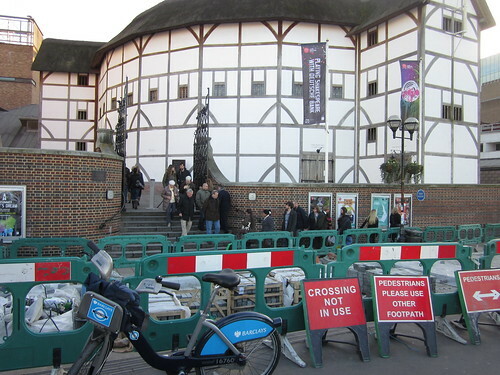 In this case, I've been in London for 16 years but I've never visited the Globe before. Actually, I did arrange to meet some people there about 10 years ago, but it went a bit wrong: I went to the site of Shakespeare's original theatre (basically a warehouse with a sign on the wall saying "here's where the old one burnt down"), while my friends went to the new theatre (a modern building with a stage and a restaurant). Ah well, live and learn. The point is that I ought to take advantage of being able to visit places like this while I'm here. You may notice the stuffed up coat in the luggage area; when I left my flat in the morning, I didn't realise that it was going to be so warm! After I'd taken that photo, I returned the bike to Poured Lines (19 minute round trip), then walked back to the gates to actually answer the question. The "right hand gate" refers to the view from the river, as seen in my photo. However, the gates have different figures on each side. Since both gates were open, that meant that the side I needed was now against the wall. There were signs on the gates which implied "don't touch", so I didn't think that they'd appreciate me closing the gate to look at the back. I compromised by just moving it a little bit, then peering round behind it. I then hit another snag: "Back a bit, back a bit, uh oh..." I didn't pay enough attention to my feet, and accidentally walked backwards off the top of the steps. Fortunately my flailing arm caught the bannister rail, so only my pride was hurt. I never expected the BCQ to be an extreme sport! I don't know whether those gates are closed at night, but I've now got visited enough checkpoints to submit my first answer card and I've attached a letter with a few comments and suggestions. After I'd finished at the Globe, I walked across the Millennium Bridge, then took another bike over to Covent Garden. I cycled along the embankment, and noticed several people in costume. I'd noticed a few of them in Southwark, and this group were all dressed as foxes. I know a couple of "furries", but it's unusual to see this many at once so I'm guessing that they'd been to the Hyper Japan convention. I then went up Northumberland Avenue towards Trafalgar Square. Unfortunately, there was an incident here that spoiled my good mood for a while. The traffic light at the end of the road (before the roundabout) was red, so there was a long queue of traffic. I waited patiently in line, and after a while I heard someone sound their horn behind me. This is nothing new: sometimes I've heard a long line of cars (or rather drivers) all pounding on their horns, but this doesn't do anything to magically speed up their journey. After the third honk I turned around, but I couldn't see any obvious problems, so I faced forward again. I then lurched forward about 50cm, because the car behind had driven into the back of my bike. I kept my balance ok, so I wasn't injured; it probably helped that I was off the saddle with my left foot flat on the floor, rather than standing on tiptoe. I turned around, and saw the car behind me speed off so that it could turn right into a side street. The driver and passenger both looked angry, and the passenger shook his fist at me, so presumably they thought that I should have moved out of their way sooner. The thing is, I didn't notice them indicating (I'm not sure whether they were or not), and if the driver had just opened the window and asked me to move then I'd have been happy to oblige. As the car left, I made a note of the licence plate and the colour/model, so that I could follow up on this later. I continued my journey, and dropped off the bike in Drury Lane 26 minutes after I picked it up, so that was safely inside the 30 minute threshold. Let us know if you're involved in an incident while using the scheme. Our first concern is for your safety. It's very important that you let us know of an incident even if no one is hurt, as it may be that the cycle (or other vehicle) has suffered some damage. You need to call our Contact Centre on 0845 026 3630, who will instruct you what to do. So, I phoned them today. They asked whether I'd reported this to the police, and I said that was my next job. They asked me to call them back when I get a crime reference number, and I'll be happy to do that. Each bike has a unique number on the side, but I forgot to make a note of this at the time, and they were able to tell me what it was over the phone. As for the police, I've sadly been in enough incidents like this that I'm getting better at the procedures to deal with them. Last February, someone changed lanes without looking and pushed me against the kerb. I wasn't hurt, and the bike wasn't damaged, so I reported this to RoadsafeLondon. However, they emailed me back to say that they don't deal with collisions, so I needed to report it directly to my local police station. In April, someone opened his car door as I went past and knocked me off my bike, then refused to provide insurance details. So, I went to the local police station to report both collisions. They gave me a form for each one, and I spent about 45 minutes filling these in. This time, I downloaded a self-report collision form (form 207) from the Met police website, printed it out at home, then dropped it off at the local police station when I'd filled it in. This had the advantage that I could use Google Maps (in Streetview) to identify the exact junction where it happened. I only had to fill in section 4 (pages 5-7), and page 6 asks: "Was the registration mark of the other vehicle recorded by you at the time of the collision?" Underneath, it says: "NB: The original note of the registration mark of the other vehicle is an important exhibit, it must be retained in a safe place and be kept for production at court if required. In this case, that means that I need to hold onto the piece of paper where I scribbled down the car's details. I assume that's because it's a "contemporaneous record"; we have similar rules in SJA, which is why it's best to write everything down on the official paperwork. Anyway, I'll see what comes of that. The traffic unit will post me a crime reference number, which I'll pass on to the Barclays Cycle Hire people, and maybe they'll apply a bit of pressure on my behalf. Returning to yesterday's events, my next stop was the Specialized Concept Store at Covent Garden. When I specced out my previous touring bike, I knew that I wanted a synthetic saddle (rather than leather). However, I hadn't actually sorted one out by the time that Roberts had built the bike, so I just bought one at Evans on my way to collect the bike. It was from the Specialized Body Geometry range, and I never had any trouble with it, but I wasn't sure which size to get. This time around, I decided to do things properly. They have a gadget in the Covent Garden shop (free to use) which will basically measure your bumprint. The idea is to sit down on it with your legs at a 70° angle to your torso, i.e. your knees should be raised a bit higher than your waist; I assume that this is to simulate the riding position. Once you've done that, you can measure the distance between the two dents of your "sit bones" (ischial tuberosities). These dents fade away quite quickly as the foam pad resumes its normal shape, but I measured 150mm. I then remembered the carpenter's phrase: "measure twice, cut once" so I decided to try again. This time the size came out as 120mm! I tried a third time, and it was 120mm again, so I accepted that as a valid result. Confirming a measurement is quicker than the original measurement because the markers on the ruler should already be in the correct position from your previous attempt. There's a conversion chart on the back of the gadget, which said that I'd need a 143mm saddle (their medium size). I looked at the various models on display, and went for a Phenom Expert. The website lists that under mountain bike saddles, but says that it's also suitable for road cycling. Anyway, I'll see how it works out once my new bike is ready. I bought some new cycling shoes as well (since the soles on my old ones have cracked in half), then went to Gosh! to pick up new comics. After that, it wasn't really practical to hire another bike, because I wouldn't have space to carry everything. Instead, I caught a bus from Oxford Street to Victoria. That bus went on diversion, then stopped at Marble Arch and turfed everyone out because it was behind schedule, and it took 45 minutes just to get that far. I caught another bus down to Victoria, and the entire journey (from Gosh! to Victoria) took about 1h20m. Cycling would have been quicker and cheaper, so that does show the value of hire bikes for certain journeys. Anyway, all in all I think that was a good day.